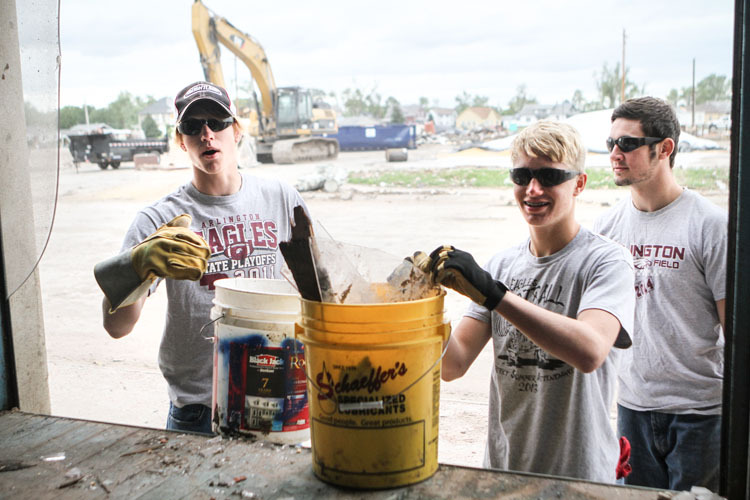 A group of Arlington athletes and the coaches traveled to Pilger last week to help in what ever way they could. 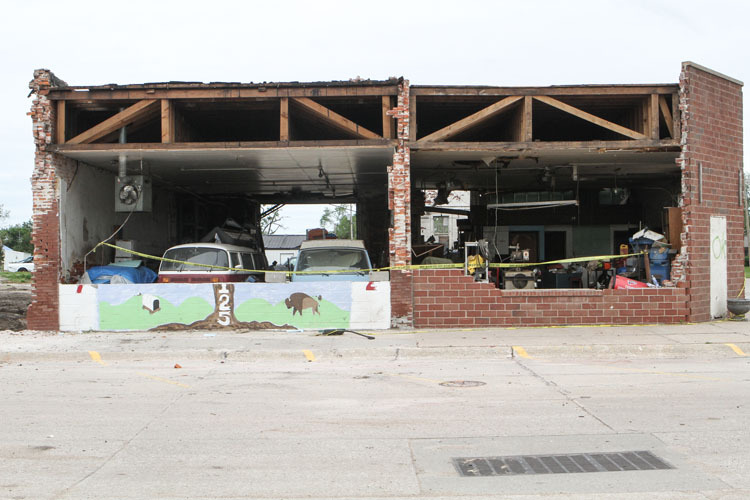 One group picked up paper and debris in and around the old co-op building that was in the process of being demolished. 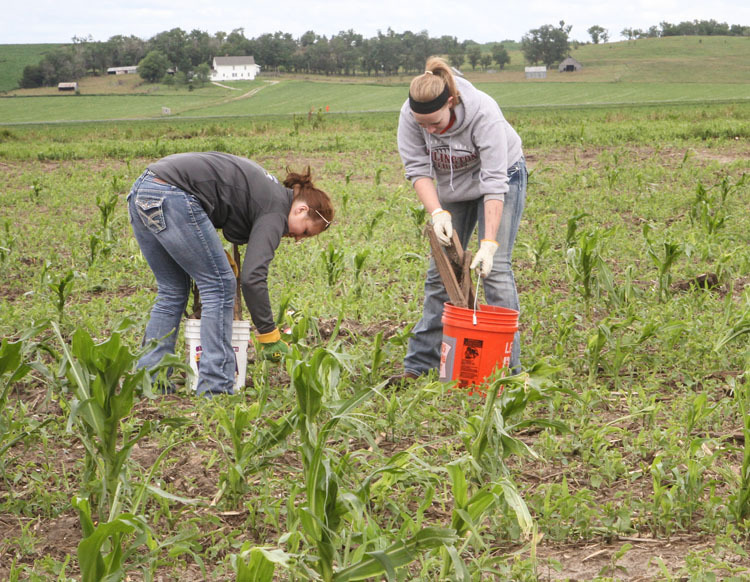 Another group picked up pieces of wood and metal that littered a nearby corn-field. 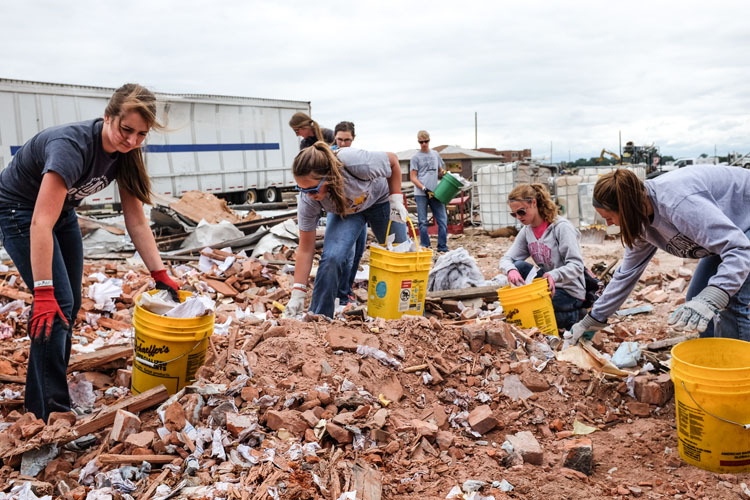 Volleyball coach Jessica Scott spearheaded the effort to bring the 18 students and coaches to volunteer in the battered town after seeing the devastation while taking her team to a camp in Wayne. Enterprise Online editor Leeanna Ellis and I accompanied the group. 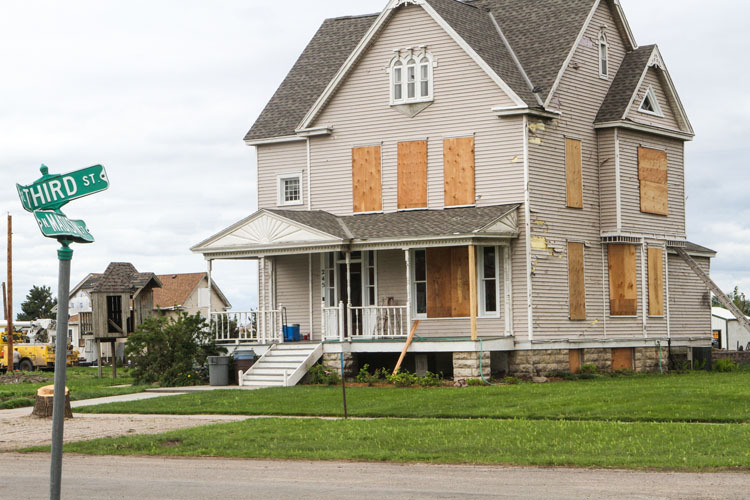 I did not fully appreciate the extent of the loss of trees and vegetation, as well as homes and businesses until Leeanna and I viewed images of the town on Google Maps as the town appeared before the tornado. 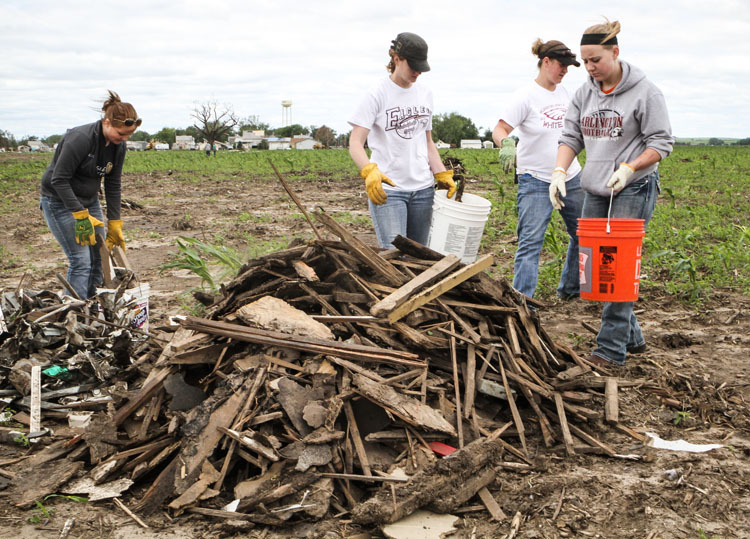 Arlington student Katelyn Ladehoff, left, teachers Amber Sims and Janelle Lorsch and student Makaela Toebben pile debris in a cornfield east of Pilger. 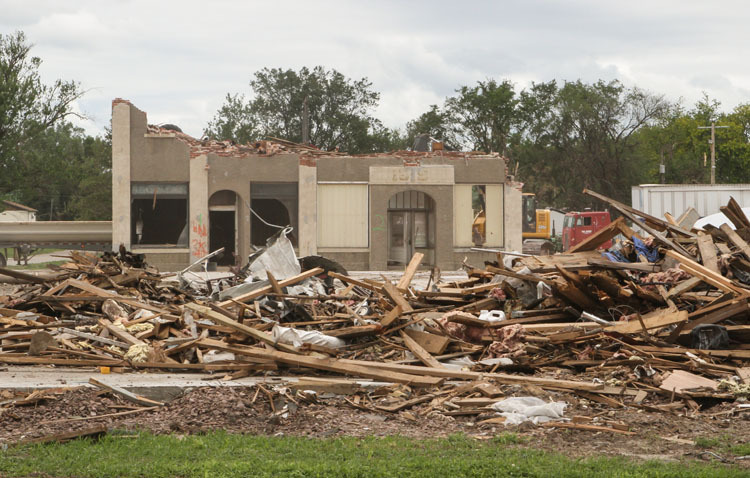 Gary Koehlmoos of Pilger tears down the old co-op building in Pilger. 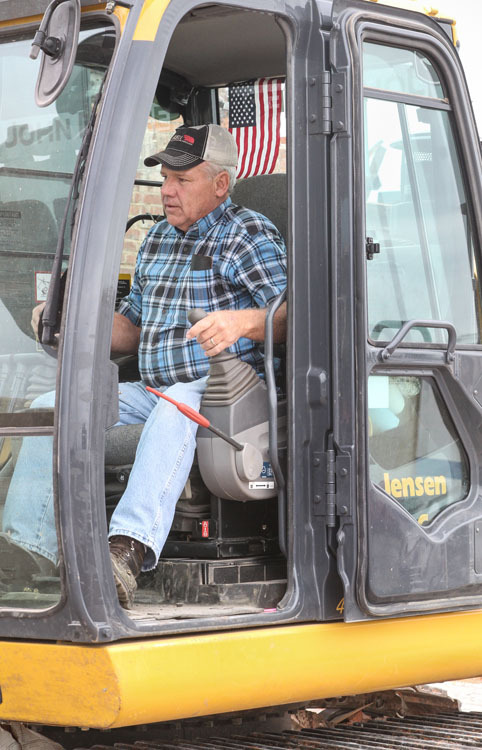 He has been responsible for tearing down a majority of the buildings in the business district. 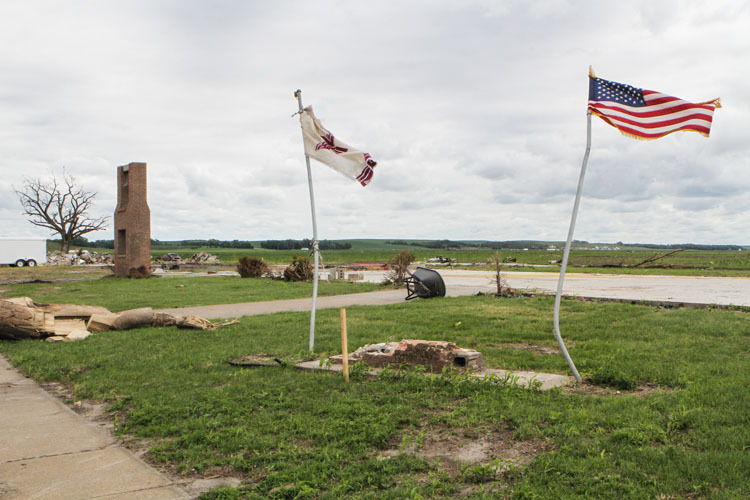 Nothing left of the Lutheran church except the flags and bell. 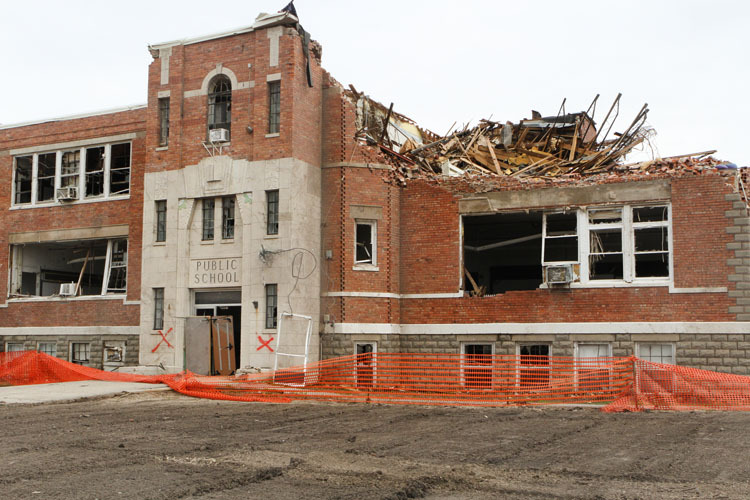 The Wisner-Pilger Middle School which was badly damaged during the June 16 tornado is scheduled to be demolished. 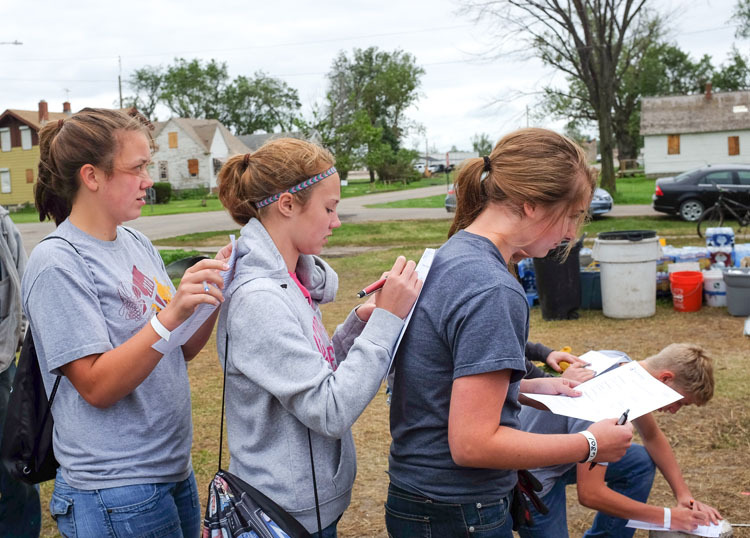 Arlington students fill out liability waivers. Students carrying bucket loads of debris. 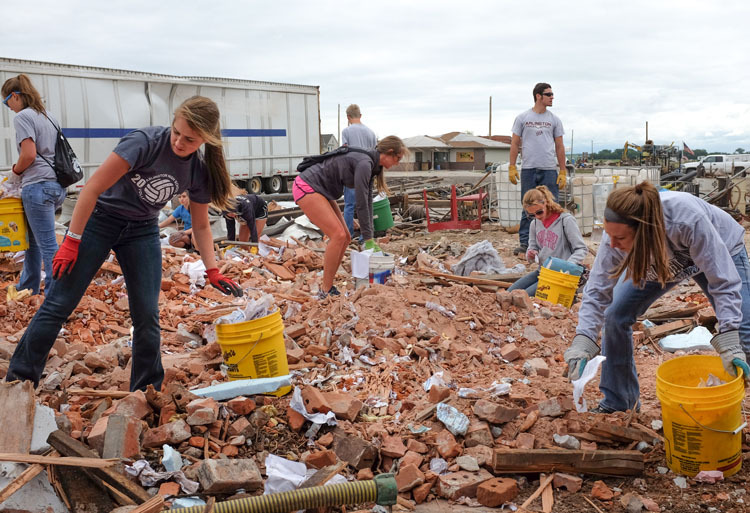 Coaches and students piking up debris. Boys picking up debris in front of the old co-op building. 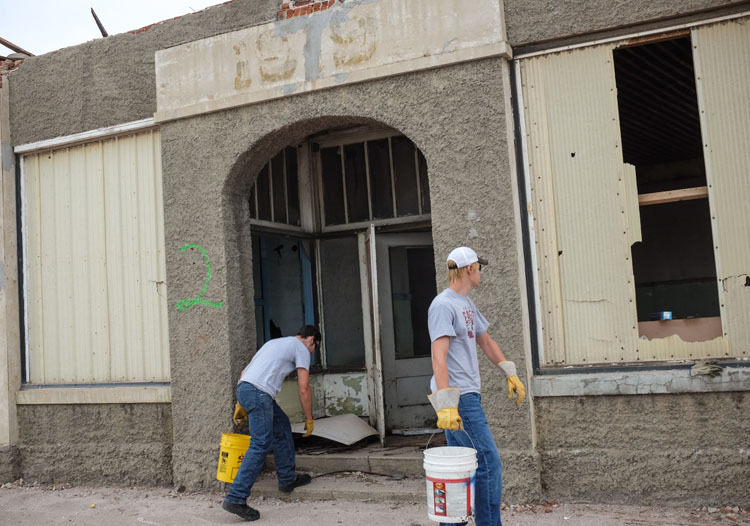 Boys picking up debris from old co-op building. 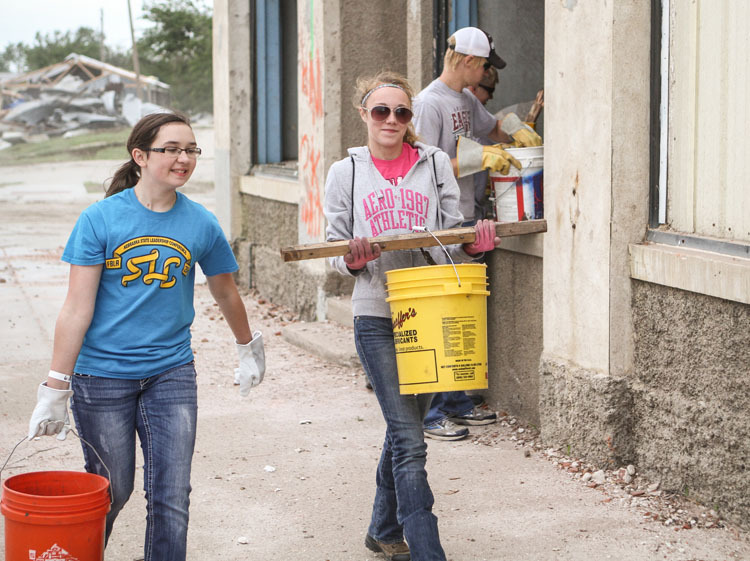 Students pick up debris from a cornfield east of Pilger. 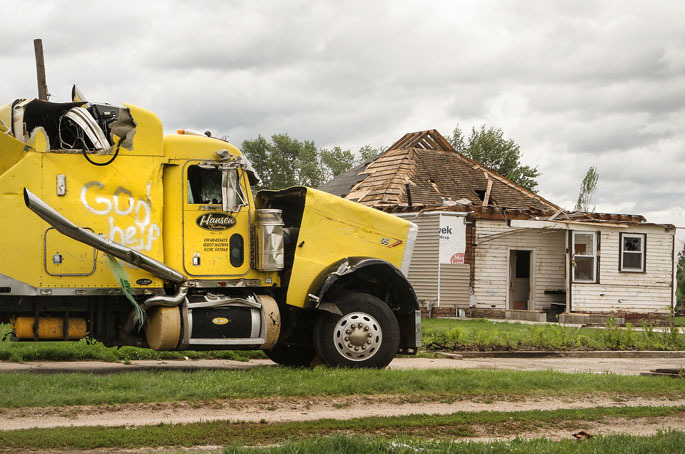 Wrecked co-op building in Pilger. 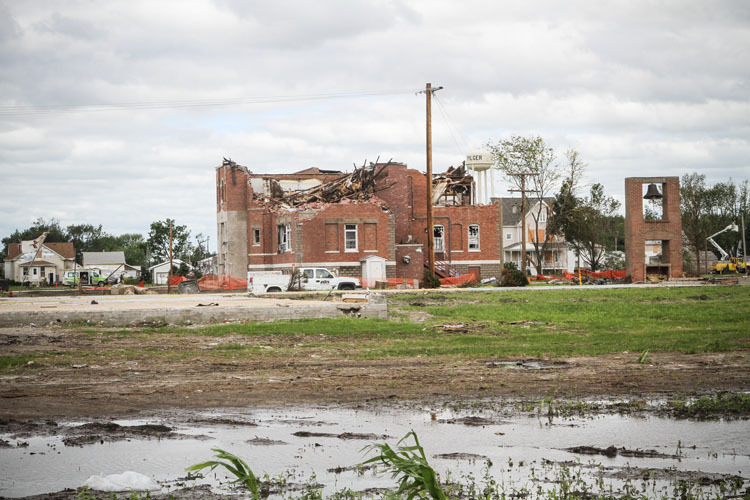 Looking west from Lutheran church site toward Wisner-Pilger Middle School. House at the corner of Third an d Madison streets remains standing while very little remains around it. 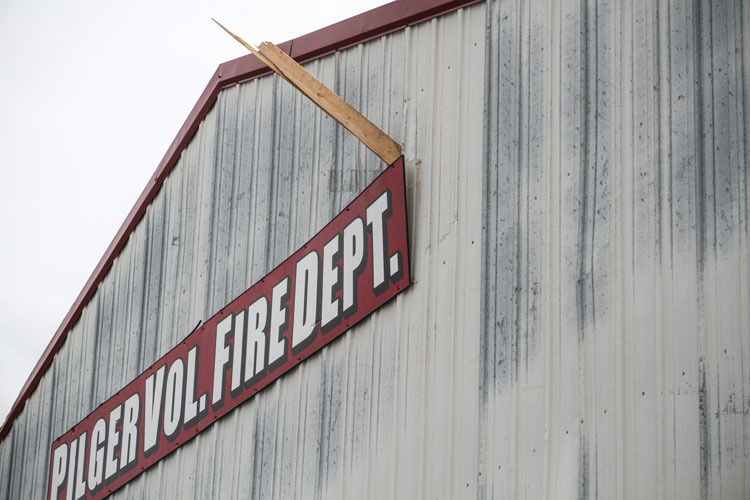 Wooden timber lodged in the exterior wall of the Pilger Volunteer Fire Department station. 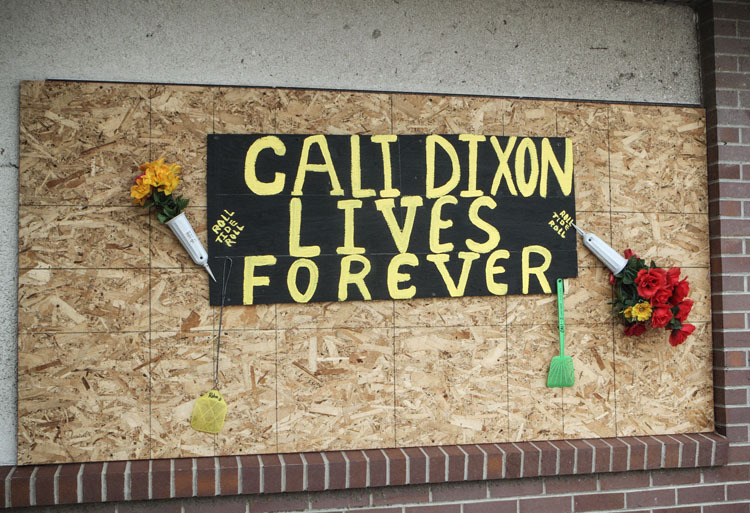 A memorial to 5-year-ole Cali Dixon, who was killed in the storm, hangs on the outside of the Pilger Public Library. Previous Blair Swim Team home meet.